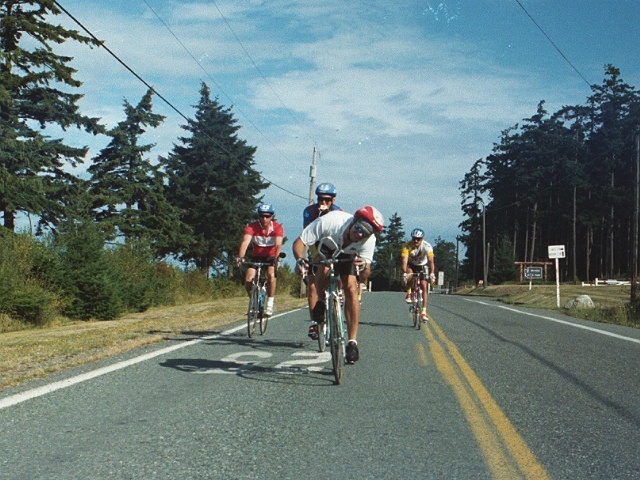 For years, when I wanted to take a picture of a group I was riding with, I'd have to sprint ahead half a mile or so, get off the bike, get out the camera, frame the shot as they approached, take the picture, put away the camera, get back on the bike, and catch up with the group. That could get tiring the tenth time in a day, especially in the mountains, so I came up with a solution: a simple mounting base that holds my Olympus OM-1 on its winder on my rear rack, with a pushbutton remote switch on the handlebars. The mount itself is a routed cradle of balsa wood glued to a 5/8-inch plywood base. A single screw both clamps the mount to the rack and engages the tripod mount on the winder to hold it in place. 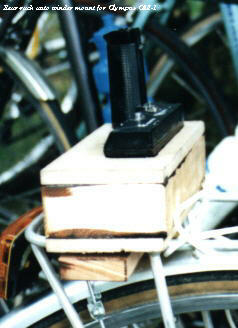 Here's what the winder looks like sitting on the mount on my touring bike. Now, the OM-1 is a pretty basic camera: no auto-focus, no auto-exposure. It works just fine without a batttery. So how do I frame and focus with it? I use a relatively wide angle lens, 28mm, and ISO 400 print film. The wide angle means I can frame the picture by aiming the bike -- I'll get the full width of the road behind me and plenty of scenery, so precise aiming isn't necessary. The fast film lets me select a relatively small aperture, which combined with the wide angle lens gives great depth of field, from a few feet to infinity. I select a shutter speed that gives slight overexposure in the lighting conditions when I start riding, and rely on the wide latitude of modern print films to deal with lighting variations. Does it work? Yes, actually pretty well. You can see some of the pictures I took with it in my writeup of the North Cascades Highway, where all of the on-road shots were taken with this setup. Josh Putnam's Home Page | Josh's Bike Page. | Josh's Framebuilding Page. | Josh's Photo Page.